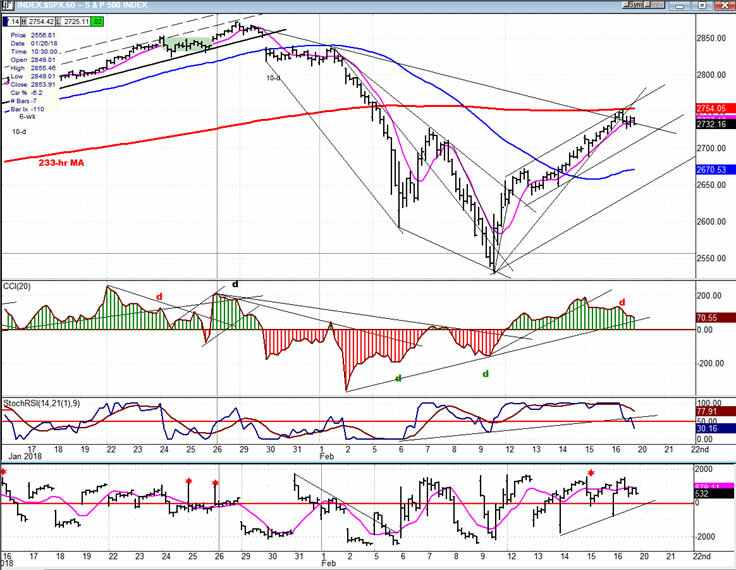 Intermediate trend – An intermediate correction from 2872 is currently underway. “We have reached a point where we could get a reversal, temporary, and then extend the uptrend, or one that could finish the move entirely and lead us back down to the former lows. There are three reasons for this: 1) Basic projections 2720-2730 have been reached. 2) I have developed negative divergence at the hourly level. 3) a cycle low is due next week (rather than Friday/Tuesday). Arguments against: 1) there is a good projection to 2760 and, since we have already gone beyond 2720, it’s possible that we have formed a larger base in a V-shape, which could even carry us back up to 2900 after a short-term correction. Furthermore, I do not have any distribution pattern at the current level. 2) Although there is a good probability that the hourly indicator will give a sell signal, and the daily indicator is still in a sell position, if we only have a short-term correction with limited downside (… points), followed by another buy signal at the hourly level, the daily indicator could then be in a position to give a buy signal. Furthermore, the daily A/D indicator has given a buy signal and would have to be neutralize by a sell signal. 3) I am not sure of the strength of the cycle due over the next few days, but there other cycle lows due at the end of the month, and another cycle low due in mid-March. The rebound from the 2540 low retraced about .618 of the initial decline when it reached 2754 on Friday. Since this matches a P&F projection count given by the base established at the low, it’s a pretty good guess that we have reached the top of the six-day rally . As we will better see on the hourly chart, the market behavior after reaching the projection and going into the close appears to confirm it. In addition, as stated in the Market Summary comment, a cycle low is due next week, and several others are due going into March. This should indicate that the initial pull-back will be minimal, and perhaps followed by a period of distribution into the end of the month. After that, the March cycle could take us to a new short-term low. What happens after the March low will decide if we continue to rally to a new high, or whether the pressure from the 40-week cycle (which is in a declining phase until May) will prevail and send us down to retest the 2540 low, and possibly lower. It would not take too much to get a buy signal in the daily oscillators. A pull-back followed by a good enough rally could get them in a buy position which could then extend the move beyond 2754. Besides reaching P&F Projections verified by a .618 Fib retracement, the index met with resistance when it touched the 233-hr MA. This caused the price to reverse, break the trend line as well as its shorter MA (which has been a good indication of buy and sell signals in the past), and start to decline into the close. The A/Ds lost two thirds of their gains, also suggesting selling pressure. Of the two oscillators, the SRSI – which always leads – has already given a sell signal, and the CCI, which recently showed negative divergence as the index approached its high point, is also on the verge of giving one. For confirmation, it needs to break its trend line – which normally confirms the breaking of a price trend line– and become negative. Since we are expecting a cycle to bottom early next week, assuming this is correct, we should expect a weak opening on Tuesday. There are a couple of things which the index must do to signal its intention to continue its rally: 1) It must remain above its blue MA as it consolidates its gains, and 2) it must rise above the red MA after that consolidation. A buy signal must also be generated by the daily indicators. The FAANGs (which appear in the top tier, in the proper order) reacted individually to the correction, with Facebook being the one the most affected, along with Apple and Google. But Apple has had by far the best recovery of the three, and Facebook the worst. Netflix could be ready to make a new high! The bottom tier probably has a better record as market leaders, and the consistent star among them has been TRAN (third from left). 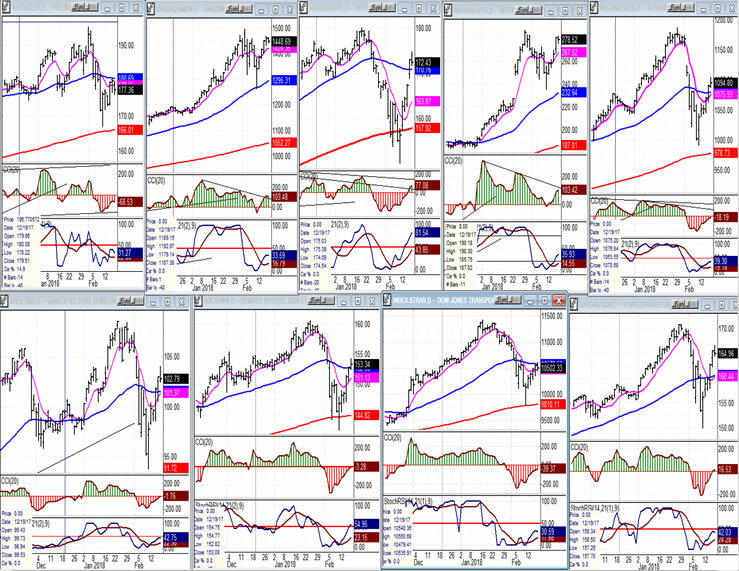 It topped a week or more before all the other indexes shown, except for AAPL which topped at about the same time. Its weak recovery could be a concern about the current state of the market. Note that, along with Facebook, it has had the worst rebound, not having been able to rise above its blue MA. It will bear watching how it performs during the coming pull-back. UUP has resumed its decline and looks destined to make new lows -- probably down to about 22.50, at least, where the top of the 2011 base should start to offer some support. 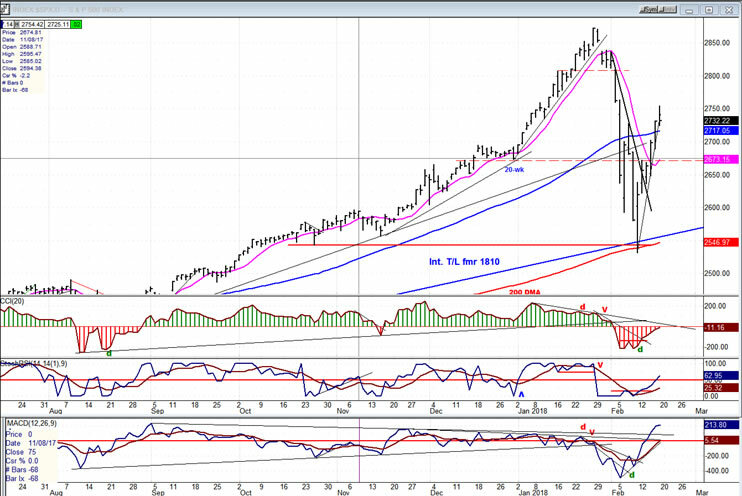 Erik Hadik has mentioned a 18-20 week cycle in GDX, so it’s possible that this is what caused the severe retracement of GDX down to 21 (I had the 20-wk cycle bottoming about next week). Whatever it was that drove the index down to that low, in conjunction with a dollar spike rebound, it is behind us, and last week’s pull-back appears to have been caused by resistance met around 23.00. So far, it has not affected structure, which remains bullish as long as we can rally without going much lower, first. I had mentioned last week that the decline to 21 had ruined what was the formation of a good-looking base pattern. 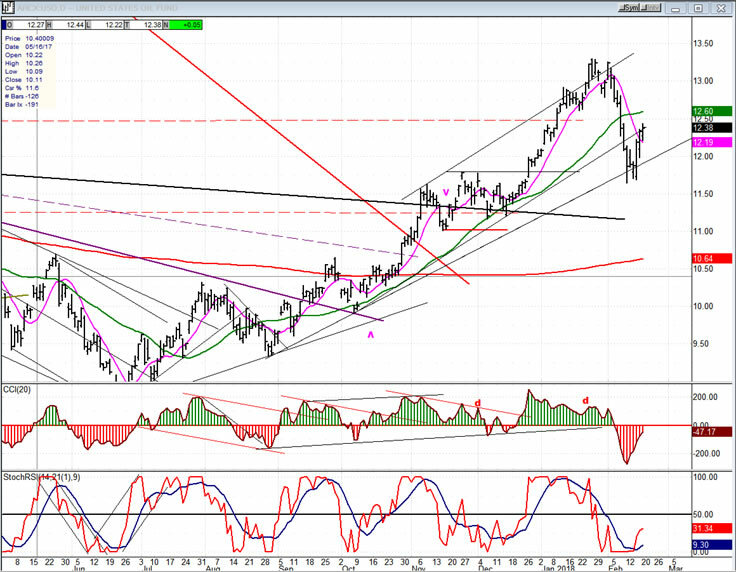 The rally to 23 followed by a pull-back to 22.50 has somewhat repaired it, and if we can get to 24 on the next rally, it would prepare for a reversal on the 3X chart which did not suffer from the pull-back to 21. 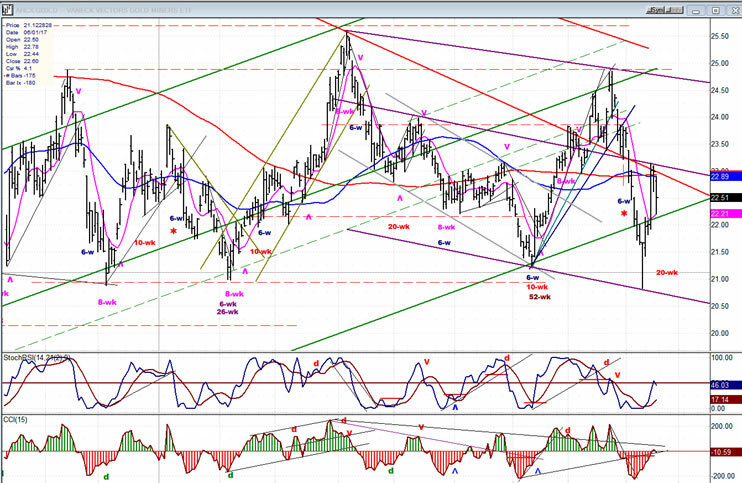 A little more time is needed to see if GDX can get to 24+ over the next week or so. Printing 25 would most likely cause a break-out of the established base. 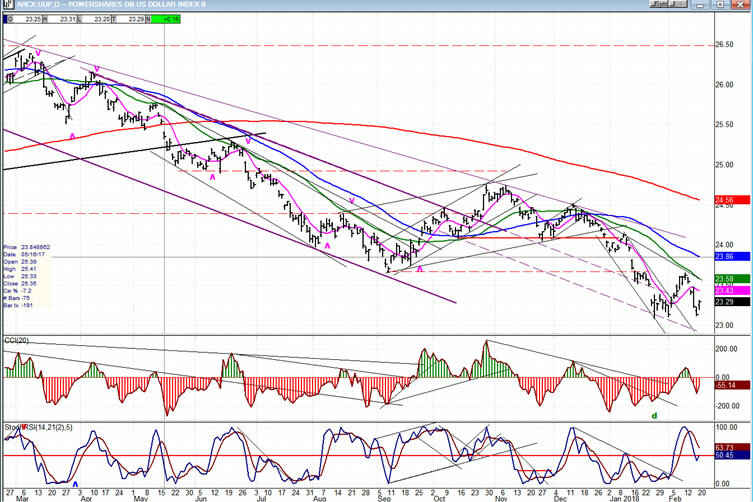 USO is correcting its advance from 8.65. It has found support where it should have and rebounded, but may have to do some additional consolidating before it can move higher. After rallying from its 2540 low as quickly as it came down, SPX completed a .618 retracement of its decline and looks ready to move down again. Since there is no distribution at its last Friday high, it is possible that it will have to create some if it is now ready to retest its low. It could also simply consolidate and move higher from here, although a new high may have to wait until after the 40-week cycle makes its low in May. We need more time to clarify the market’s intention!